In the Gertosio Family, Jean previously in the catering trade was the first to setting a course to the yachting industry.We are in the sixties when Jean Gertosio joined the company JEF MARINE, representative at the time of the brand “Riva”, among others. Over the years, Jean found his place in the company and when “Jef” passed away, Jean naturally became business partner. This particular brand is ARCOA, short for “Arcachon Coach” that will turn to “Guy Coach” later on.“My father spent his entire professional career representing Guy Coach, in the port of Golfe juan” continues Pierre Gertosio, now director of CNG Agence du port.A commitment to the life of the town that Jean Gertosio later confirmed by becoming city hall assistant under the mandates of Pierre Donnet from 1977 to 1995. During these years, he participated to the greatest achievements of Vallauris- Golfe Juan, in particular the construction of the Port Camille Rayon supported by several personalities from this region. “My father was a visionary for the development of the yachting industry and the Employment, therefore he fought to convince the sceptics and prove that the wellbeing of the town was dependent upon the built of the new marina.” A period of time that Pierre experienced at first hand “I was born as the same time as the yachting industry” he specifies with pride. Pierre took his first steps on the beach where Napoleon landed in March 1815. The sea air is his oxygen. He’s imbued with yachting and grew up doing little jobs on the port while he learned all the cogs of what will become his future business. In 1974, Pierre Gertosio bought back CNG Agence du port; his son Pierre assisted him during few years before taking over the management. While the CNG Agence du port Management is handed over to Pierre, Thomas, born in 1987, joins the team and completes the family. The third generation is up and running and Thomas’s birth coincided with the built of the new port of Golfe-Juan. Like his father before him, Pierre Gertosio wanted to make a name for himself in the yachting industry and choose the Brand he wanted to represent. Pierre then became the first CRANCHI dealer on the port. “At the very beginning of the port there was “Rodriguez” who is not any more here physically, Mister Claude Blackman (Jef Marine), Mister Daniel Bussani who was then a saddler and Gardanne at the fuel station ” he summarises. Today, Pierre is considering taking a step back from its activity and passes the baton to Thomas who represents the internet generation. “The yachting industry had been deeply transformed with the arrival of new modes of communication, and as all people of my generation, I had difficulties adapting to this new way of communicating. Thomas arrived just in time to facilitate this transition” he admits. Despite the ongoing 2008 economic crisis and in these insecure times Pierre Gertosio wishes to remain optimistic “Boats still make people dream, yachting remains a luxury hobby and we have to encourage a certain type of clientele to come back to the French Riviera. 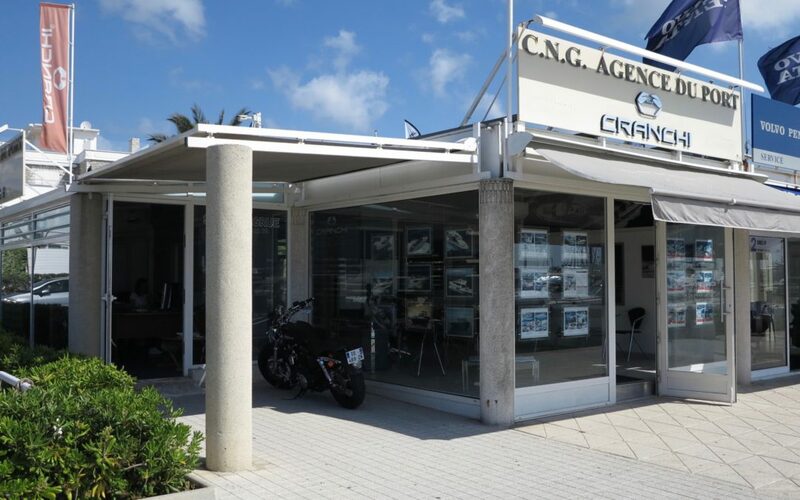 Here, we have everything we need to work with” confirms the director of CNG who also know that all actors of the Port must launch a plan of action to preserve this beautiful working resource and framework of social harmony and leisure.